James Joseph “Whitey” Bulger, the former organized crime figure from South Boston, Massachusetts and head of the Winter Hill Gang was dressed in his orange prison jump suit as he was sentenced today to two life sentences in prison plus five years by a federal judge. Ha, because after 2 life sentences, those extra 5 years just put the cherry on the sundae. The 84 year old Bulger was convicted earlier this year of charges that he participated in 11 murders, drug trafficking, racketeering, money laundering, extortion, and pretty much every crime that took place in South Boston. Good riddance, this man will spend the rest of his life in a cage. 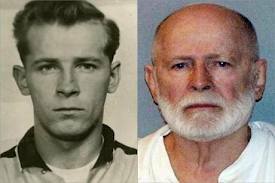 Notorious Boston gangster James “Whitey” Bulger was sentenced today to two life sentences in prison plus five years by a federal judge who cited the lives that Bulger wrecked as he rampaged for decades through the city’s underworld under the protection of corrupt FBI agents. The testimony of human suffering that you and your associates inflicted on others was at times agonizing to hear and painful to watch,” said US District Court Judge Denise J. Casper, who recited, one by one, the names of the people Bulger murdered. “The scope, the callousness, the depravity of your crimes, are almost unfathomable,” she said in the stillness of a courtroom filled with teary-eyed relatives of the killer’s victims. Bulger, 84, was convicted earlier this year of charges that he participated in 11 murders, drug trafficking, racketeering, money laundering, extortion, and other crimes. Bulger fled Boston shortly before his 1995 racketeering indictment. One of the FBI’s 10 Most Wanted — along with Osama bin Laden — he eluded a worldwide manhunt until he was captured in June 2011 in Santa Monica, Calif.